GFG Modern Room Escape is another point & click escape game developed by GenieFunGames. 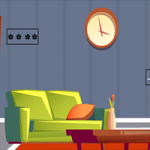 In this easy and mind-relaxing game, imagine that you have been trapped in a modern room. Your aim is now to escape from there by finding useful and interesting stuff: objects, clues and symbols. Solve all puzzles you will encounter on your way to finally escape from the modern room. Good luck and have fun! one-before-last key: getting a key for a key was a little poor. otherwise a nice little timekiller. the actual rating 3.5 stars I find very adequate.